The Friends and other members of the Wales Heritage Group will be in Cardiff on Tuesday 8th November, 9:30am-3:30pm exhibiting in the Neuadd at the Senedd, at an event open to the public and sponsored by Ken Skates AM. Come and see us and find out more about the Wales Heritage Group; an alliance of statutory consultees and voluntary national organisations active in the conservation of the historic environment in Wales – “the voice of the independent heritage movement in Wales” . 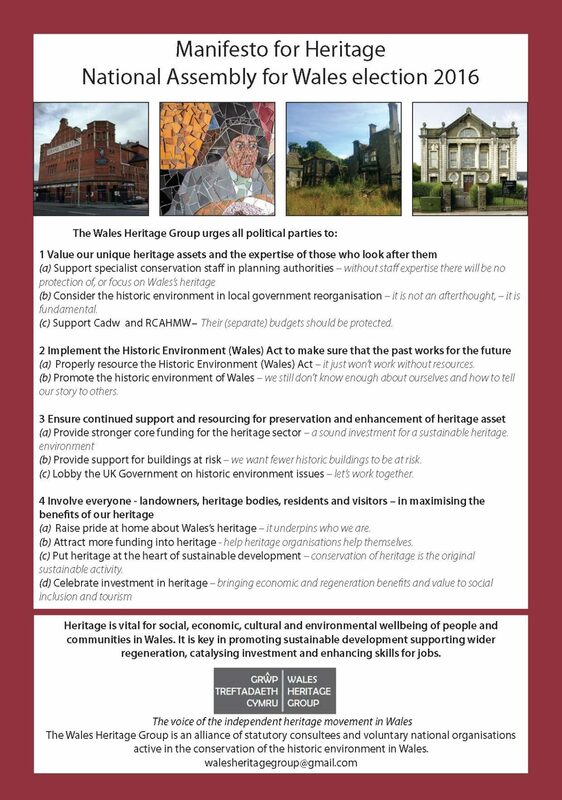 Heritage is vital for social, economic, cultural and environmental wellbeing of people and communities in Wales. It is key in promoting sustainable development supporting wider regeneration, catalysing investment and enhancing skills for jobs. This will be an opportunity to learn about the work of independent heritage movement in Wales that are striving to support the protection and regeneration of much of Wales’ heritage. Addoldai Cymru Welsh Religious Buildings Trust, Ancient Monuments Society, Civic Trust Cymru (secretariat), Council for British Archaeology, Friends of Friendless Churches, The Georgian Group, Heritage Trust Network (formerly the Association of Building Preservation Trusts), The National Churches Trust, Society for the Protection of Ancient buildings, Theatres Trust, The Victorian Society, Twentieth Century Society , Welsh Historic Gardens Trust.